Canterbury and Whitstable Greens organised a successful march as part of the global day of action to send a strong and clear message to the 125 world leaders meeting this week to discuss climate change. Around 100 people gathered on the beach in Whitstable after a cycle ride from Canterbury to send that message to David Cameron. 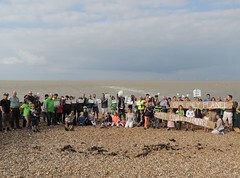 Stuart Jeffery, Green Party Parliamentary Candidate for Canterbury and Whitstable: "Around 20 cyclists left Canterbury collecting people along the Crab and Winkle Way before arriving on the beach in Whitstable with around 100 people. Such a fantastic turnout shows just how strong people feel about the need for urgent action on climate change. "Action is needed urgently. Last month was the hottest August on record globally, while wildfires, droughts and floods are plaguing the world. Without urgent action these extreme weather events are set to get far worse. "There is little political will among the Lib Dems, Labour or Tories while UKIP seems to deny that climate change is man made. This must change - politicians of all colours must embrace the need to urgent action and they must take it. "We need to see a huge investment in clean green renewable energy, with a significant expansion of public transport and a real drive to insulate homes and businesses properly. These steps will not only cut our CO2, they will create jobs too."